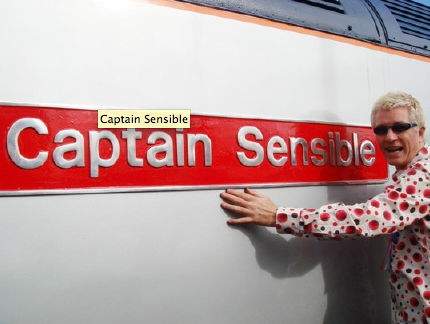 As we head into 2013 I thought it would be a good opportunity to talk to you about a figment of my coaching imagination – this is a person I call “The Intelligent Athlete” or if we think of this person as a much more fun character -“Captain Sensible”. Recently I may have mentioned this character to some of you as a way of encouraging you to think a little bit more sensibly about how you go about your decision making relating to racing, training and recovery. You see the intelligent athlete is what you all should aspire to be more like on a daily basis. I could call this character “The Perfect Athlete” but as we all know perfection in triathlon is unattainable, but we can all do a better job of trying to get as close as possible. Its my job as a coach to help point out these mistakes and encourage you to move along a the right path, the reason I can do this is because I’ve made most of the mistakes myself over the years and don’t want you to do the same. I also see athletes I work with keep making the same mistakes over and over again on a daily basis, which can very frustrating for both me and the athlete concerned. My goal in essence is to turn you all into an army of “Captain Sensibles” so that you flourish as athletes. Without question its the athletes that learn to make the right decisions at the right time that will ultimately go the furthest in this sport and at the fastest rate. You should remember that what you have in between your ears is one of the most trainable parts of your body, the way you think and respond to certain situations you are faced with will ultimately determine the type of athlete you become and how far you progress. So what might you ask are the common characteristics that makes someone an Intelligent Athlete or a Captain Sensible? – Never just ignore injuries or little niggles, if there’s pain and discomfort they realise that something is wrong so they will endeavor to get it looked at by a professional therapist a.s.a.p. before it gets worse. They don’t think to themselves “oh its not too bad or I can run through it”, they realise that their body is telling them something so they need to back off immediately and focus on other areas. They also meticulously follow the rehab a trained therapist has given them to avoid the injury re-occurring. – Realise that when they are ill their body needs to rest to get better, they don’t keep pushing through the training just because it on the plan. It doesn’t matter whether it a cold, chest infection or sore throat your body needs full rest to recover. They know the sooner they back off and rest up the sooner they will be back in the game so eating healthily and getting plenty of sleep will be the key to success. -Realise that when coming back from illness you don’t just bounce straight back in to normal training, they usually start again with a very gentle build up over a few days if the illness was short (i.e. a few days) or over a week or two if the illness was longer (a week or longer). – Realise that recovery is just as important as the training they are doing so taking a day or two off or a recovery week is not a sign of weakness. They are clever because they know their bodies need time to absorb the training they are putting in so factoring in their recovery is crucial for their fitness development. – Have common sense approach to their training plan, they know that the sessions are not set in stone and can be moved around depending on their levels of fatigue or if they have a lot of work on or even family commitments. No plan is ever set in stone and needs to be adapted depending on how you are feeling on that day, so if you’ve got a hard threshold swim, bike or run planned and you feel completely exhausted, it is a good idea to just do a shorter more gentle session based around recovery not stressing your body further (or even take an extra days rest if you feel completely flat). They know if they do this they will probably wake up the next day feeling fresh and ready to go and well up for putting in that quality threshold session they missed the day before. – Don’t put their own twist on their training sessions, this is fine if you are self coached but if you’ve paid someone to give you advice you might as well follow it. So if a session is a 60min easy aerobic run along the river its definitely not the opportunity to race everyone you who comes passed! Individual specific training sessions are there for a reason, they have a focus to develop certain areas of your fitness that needs work or are specific to the type of racing you are doing. Executing sessions as requested is key to developing specific areas of your fitness that will help make you a better athlete. – Not continually moan to coach about being slow, they realise that speed and fitness is the accumulation of many months of consistent training and hard work without getting injured. The number of times I’ve had athletes tell me they feel slow only a few weeks into a training plan is quite astonishing! Your coach is not a magician who can suddenly make you fast in a short period of time, you need to be prepared to put the hard work in and most importantly be consistent over many months. They also realise that early season might not be the time to be fast when you’ve just taken time off over Christmas or been ill, the aim is for you to “peak” or to be fast when you race which is many months down the line. – Realise that nutrition is key to performance, health and recovery. What you put into your body is key to maintaining a healthy immune system, maintaining a healthy body weight and enabling the body to recover from the training sessions you have been completing. They know a good balanced diet will high in good sources of protein, fish, fruits and vegetables. They avoid heavily processed foods and sugar. – Always ask coach first, be it a simple text or email your coach can help you make the right decision for you. – Don’t panic last minute just because races are coming up, if you follow the plan everything will take care of itself on race day. – Remain very positive in every situation and realise negativity get you nowhere fast, essentially its wasted energy. There will always be a way forwards no matter what problems you might be faced with along the way. – Realise that making mistakes is a very good thing so long as you don’t make the same mistake twice, think of every mistake as the key to becoming a better triathlete, you should then always do it better next time. – Focus on themselves and not other people. – Are prepared to think in different ways and realise the way they have been thinking may not have helped them in the past. – They turn up on time for sessions and are very organised, they keep their heads down and getting the job done. If they have a good or bad session they draw the line under it and move on, they learn from it and focus all their attention on the next sessions and don’t look back. So as you can see becoming a better athlete isn’t just about putting in the training, there are a whole load of other factors that can contribute to making you the athlete you want to become. So if you are looking for that extra edge on your opponents then finding the “marginal gains” are crucial for staying one step ahead. Direct, to the point, sensible. Wont get any arguments from me. Like! Thanks! Best of luck with the marathon, 2 weeks is nothing in the grander scheme of things ….let me know how you go ! Yes, agree with Peachy above Julian……….it’s a great article. Going to have a good go at putting some of it into practice!! Thank you!